To load your minutes, call *TOGO from your mobile phone or call 1-877-778-2106 from a landline. Follow the voice prompts. T-Mobile To Go is a very competitive prepaid cellular option. With T-Mobile's Gold Rewards program, customers can get rates as low as 10 cents per minute with 1 year expirations on each refill. TMobile also offers roaming at no additional charge and additional features such as text and picture messaging, instant messaging, and free cellular access to a selection of internet news sites, and more. As such, T-Mobile To Go is a great option for even the most tech-oriented consumers, especially as their selection of phones and special features broaden. And, of course, for those who just like to talk, 3-way calling, caller ID, call waiting and voicemail come standard. For Sidekick users, T-Mobile also offers a Sidekick To Go program, which allows anyone to use the T-Mobile Sidekick mobile messaging device for unlimited web access, picture mail, instant and text messaging for a mere dollar a day. Voice calling on this plan is a flat 15 cents a minute. 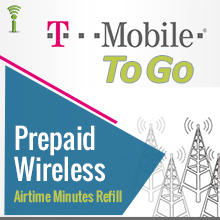 Thus T-Mobile To Go is a great prepaid service, whatever your "geek level," making good their no-fees "Get Prepaid Without Getting Burned" and their overall "Get More" promises with aplomb. And if you don't like their prepaid phone selection, you can always grab an unlocked or T-Mobile phone and have fun! Enter your PIN (PIN number). The amount of the recharge will be verified.